If there is such a thing as hell on earth for a dog, then in October 2017 we found it. 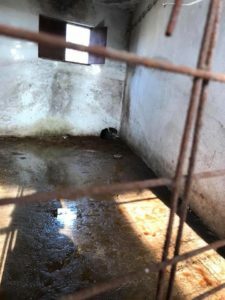 The most neglected and horrific “shelter” we have seen in Romania for a long time. A public shelter, a “legal” shelter – Europe 2018. Dogcatchers are paid EU50 per dog, they catch them from the streets using vile dog poles, not caring how much pain they cause the dog, nor how small and scared the dog is. Often people’s pets, they simply don’t care – for greed of money is their goal. The dogs are brought here, and at first it seemed, that no one was feeding them. The dogs fighting over food, so cheap that it tasted like cardboard. The scarce food maybe fed to them three times a week maybe not even that. Food thrown onto the floor strewn already with urine and faeces, and this is legal? The windows of the building were broken years ago, and with nothing there, the rain and snow pours in, the wind howling through, meeting the cries from the dogs. Each time we went, the conditions seemed to be worse. We took food and bowls to feed the dogs, who then turned on the weakest. Fighting and screaming filling the air. 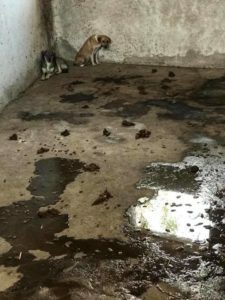 Sadly the so-called shelter and the poor condition is a “political hot-bed”, and to expose everything is to sign the death warrant for the dogs remaining inside. 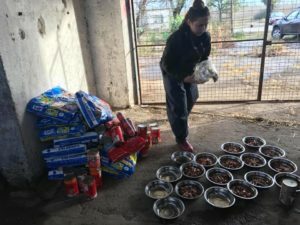 During another visit in October, we took more dogs out, the condition of many so horrific that they were in the vet clinic for up to 4 months. Our vet bills for the first 16 dogs alone was over £3,000, it was that bad. Oliver was one of these dogs. We watched as we went inside with food: the bigger dogs would not let him eat and we were scared for his life. 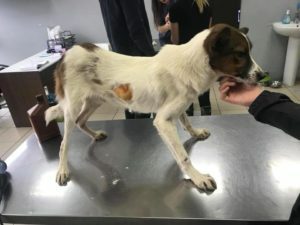 He was skinny and sick – when he arrived at the vet, he had a huge lump on one side which needed surgery, bite marks all over his weak body. We never gave up and have never given up on these dogs. 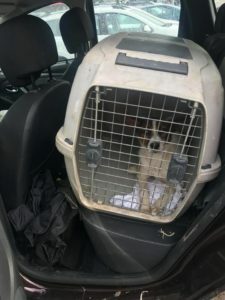 The week before Christmas, the first Lucky 13 travelled from Romania to the UK, to foster or forever homes – their first Christmas without any need for fear. Every month since, we have continued pushing our emotions to the limit, as we have had to go back in, to choose who is saved and who will die. We have to look in dogs eyes, knowing that they are starving, hungry, afraid. Knowing that greed for money is controlling their lives, and determining how and when they will die. 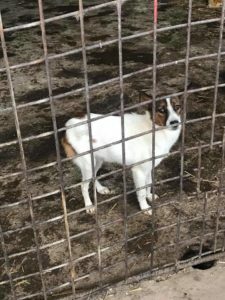 To hear that some of the dogs had been sold to be used for experiments sickened us to the depths of our stomachs. We saw photos, and heard this from more than one source and flew out again to see sights, and hear the screams that haunt us almost every night. Paws2Rescue sadly cannot determine the fate of this shelter – if we could, then we know what we would do. We cannot expose it, nor can we close it. But we do keep saving lives – and every single life that we save, means the world to us. We hope that one day, those who are responsible for making this dog look and feel like this, living in these conditions and dying in worse, are held accountable. Until that day, we will continue to speak out for those who have no voice. Thank you for helping us to keep saving lives.